At Wallpeople San Juan 2013 every participant and spectator became artists and in collaboration created artwork over an urban wall. We got to talk to some of these artists who interestingly come from different creative backgrounds. They shared with us their thoughts about the event. Here are their voices. "Wallpeople is great... If you pay attention to people's faces you can see the smiles, the happiness.... those faces you need to look for." 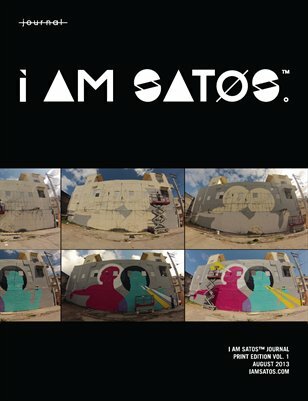 "There are many levels in the art scene in Puerto Rico. There are different markets, but I think we should be looking to contribute directly to society and promote the arts in all its shades." "There's a lot of talent here today, in an event that's totally different and open to the public. We need more of these events; it directly benefits the children. The government should insert itself in these initiatives because it helps canalise everyday experiences and situations. In the streets there is a lot of violence and discontent; I consider art as a way to alliviate the mind of those feelings with something that we all like." "It is great to have the opportunity to interact with the public and collaborate to accomplish this type of activity. The event lets children interact in a healthy and creative manner. This type of activities foster interactions and good interpersonal relationships." "Today I see a lot of motivation, especially from the children. From early in the morning they wanted to put their work on the wall. Some groups prepared specific projects two weeks before for the event. I work with the Art League's Facebook page and could observe the motivation and enthusiasm of the public." "I was really moved by the work of a student that used the song "Color Esperanza" (Color Hope). I think that songs describes hope in music, in the youth, and in the Puerto Rican culture." "Streets should be used more often by retaking the public space and mobilising people towards collaboration and interaction through art and its tools as links between individuals. The important thing is that people outside of the project can get to know about it so they can too participate in future editions." About different initiatives that have been going on in the local scene... "One cannot wait for others to do... This event is important because when different elements come together to accomplish a common purpose, the reach and results are elevated for everyone involved. Diffusion of the arts and culture should be the mission of all sectors of the Country." "I think it's a great idea that should be explored through other means of promotion. I would like to see a thousand people participating at this event... and here sponsors, support and diffusion are key for a future event. I think the local talent should be motivated more for an event like this and not restrain themselves because it is an outdoor activity, but instead embrace the fact that it encourages interaction between artists and the public. The integration of the public is necessary as an integral element of the appropriation of public spaces." "Wallpeople is an initiative for the general public to express themselves and bring ideas that are different from those for the stereotypical spaces for art. At the same time the youth can express their art, which is charged with idealism and conscience. Collaboration is key but (...) there has to be more emphasis in the interactive quality of the event so that the public has a chance to accomplish their ideas and proposals. There could even be workshops in which people can experience other tools and mediums that would let them explore their ideas with other creative approaches." "I enjoy this initiative because I think art is for everybody; art is for sharing. Art is an universal language that allows us to relate and communicate with each other." "I think there was a lot of ignorance about the event; many did not receive the invitation. There's a problem with its diffusion because these type of activities depend on the support of the public and their contribution as spectators and creators. There is a need for more effective mechanisms for dissemination of the arts in the Island that look for the inclusion of the public in the artistic and collaborative process."